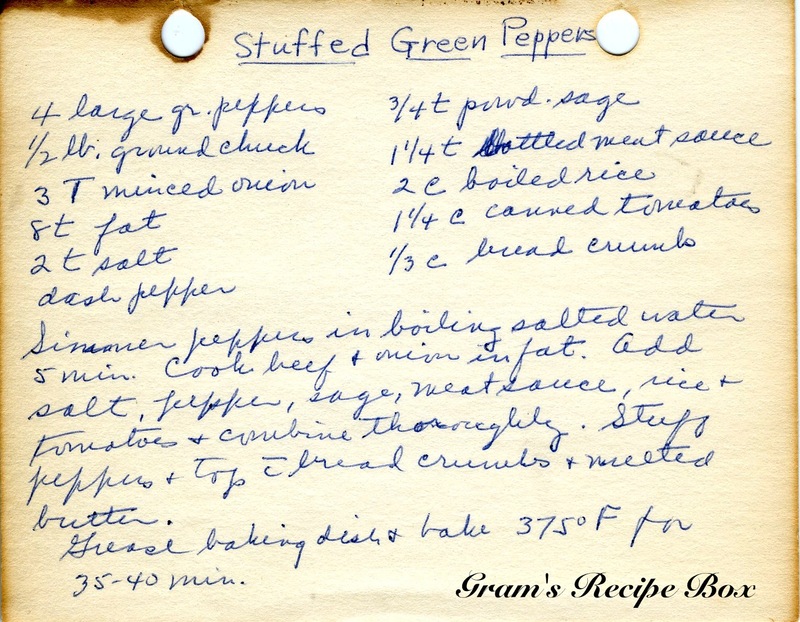 We saw stuffed green peppers at the butcher’s counter last night which reminded me of this recipe. I can’t say as I’ve had stuffed peppers because they don’t sound good to me, but clearly they were and continue to be popular. I think if I made stuffed peppers I would surely use a red pepper because I am not fond of the taste of cooked green pepper. That’s just me. As to the bottled meat sauce, this could mean Liquid Smoke or Kitchen Bouquet. A search for “bottled meat sauce” is going to give you spaghetti sauce results, so let’s all agree that it’s probably the browning sauces. The quantity is small enough that I doubt it would call for 1 1/4 teaspoons of marinara sauce. Simmer peppers in boiling salted water 5 min. Cook beef and onion in fat. Add salt, pepper, sage & meat sauce, rice & tomatoes & combine thoroughly. Stuff peppers& top with bread crumbs & melted butter. Grease baking dish & bake 375 for 35-40 min. I never thought stuffed peppers would ever be appealing, but then my darling hubby made them. They’re not traditional, but they are pretty yummy. Use any color peppers you happen to have–orange and yellow are especially nice. Then he just makes some Rice-a-Roni Spanish and throws in some cooked chicken (usually sauteed while the rice cooks in some garlic and olive oil) and tops with some seasoned bread crumbs and bakes it up. Pretty simple and a good way to use up some peppers before they go bad. My mom (once a high school home ec teacher and a great cook) used to make these, and we loved them! Like Diane (above) she used to stuff them with Spanish rice sometimes, but our favorite as kids was leftover spaghetti. Now you know what to do with leftover spaghetti! What is this “left over” spaghetti of which you speak?? ha ha — I always make a BIG batch of meat sauce, cook it all afternoon, use half, and freeze half in a bag. Did this help?